Rav Abbahu said, "Why do we blow a ram’s horn? The Holy One, Blessed Be He, said: ‘Sound before Me a ram’s horn so that I may remember on your behalf the binding of Isaac the son of Avraham, and account it to you as if you had bound yourselves before Me." "And Avraham lifted up his eyes and looked and behold, behind him a ram caught in the thicket by its horns." (Breishit 22:13) This teaches that the Holy One, Blessed be He, showed our father Avraham the ram tearing itself free from one thicket and getting entangled in another. The Holy One, Blessed be He, said to Avraham: ‘In a similar manner are your children destined to be caught up in iniquities and entangled in troubles, but they will ultimately be redeemed through the horns of the ram.' "
Like Matzah on Pesach, which is a double symbol, expressing the ideas of freedom and slavery, the Shofar is likewise essentially a double symbol. On one hand, it reflects triumph and redemption, yet it also represents "Fear and Trembling," (a book by Soren Kierkegaard on the subject of the Akeidah). sighing and wailing, on the other. According to the Talmud, the sequence of sounds should be "Tekiah, Teruah, Tekiah." The Tekiah is an unbroken note representing the positive, hopeful side of our attitude as we approach the Yom HaDin , the Day of Judgment. In between the Tekios is sandwiched a Teruah , representing our extreme anxiety as we approach the King of Kings for Judgment. However, there is a dispute in the Talmud as to the meaning of "Teruah." One opinion is that it is a sighing, groaning sound; this is what we call "Shevarim" (from the root "shavor," "to break") - a note broken into three parts. The other opinion is that it should be a wailing sound, a sound broken into many parts, as was heard in ancient times, and as is still heard today, especially in the Arabian countries, from women mourners. This is what we call the "Teruah." When it is blown, traditionally, 100 sounds are produced. 30 right before Mussaf. 30 during Mussaf and another 40 right after Mussaf, basically because of the uncertainty in the nature of the "Teruah" mentioned above. Which, actually, may be less of an "uncertainty" than a feeling that both the attitudes of sighing and of wailing, befit the aspect of being Omed L'Din, Standing for Judgment, before the Supreme Judge of the World. Generally the Shofar is blown by a person who is of sound moral and religious character, not to mention possessed of a good set of lungs. A competent Halachic authority should supervise the Shofar blowing, as there are many complex laws and requirements involved with its proper sounding. If a person cannot attend synagogue, the shofar may be blown for him or her at home. Reflecting one of the Names of the Holiday, "Yom Teruah," the "Day of Sounding the Teruah, the Shofar is blown on both days of Rosh HaShanah. 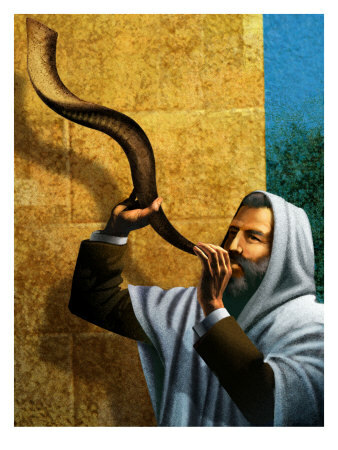 When, however, a day of Rosh HaShanah falls on Shabbat, the Shofar is, by Rabbinical Decree, not blown (for fear of someone carrying the Shofar to a Master Baal Tokea (an expert at the art of blowing the Shofar), for instruction, "carrying" being considered a melacha, a purposeful, creative act, and therefore forbidden, on Shabbat). Appealing to G-d with a simple, primal cry from the depth of the human soul. Indeed, as we ahve seen, the "Teruah" sound of the Shofar is based on the sound of a cry. Two blessings are said over the blowing of the Shofar. One blessing is over the Mitzvah (Torah Obligation) itself, which concludes "...Who has commanded us to hear the sound of the Shofar." From the text of the blessing we see that the Mitzvah is to hear the shofar. Therefore, if you see someone blowing the Shofar, or even blow it yourself, you have still not fulfilled the mitzvah if you do not hear the sound itself. An example of this is if one blew the Shofar into a chamber such that the actual sound is drowned out by the echoes. The second is the She'Hecheyanu Blessing which is said to thank G-d for, simply, giving us life, and allowing us to reach this moment, and this new experience, of hearing the sound of the Shofar in the New Year.